In this article we offer information about the interpretation of the flow-volume loop. The other spirometry tests are not covered. 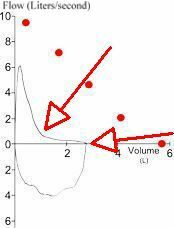 The flow-volume loop can have four distinctive shapes that are linked to certain pathologies: obstructive lung disease, restrictive lung disease, mixed lung disease and upper airway obstructions. 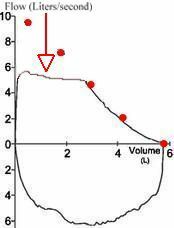 A normal expiratory flow-volume loop has a triangular shape with it's top at the left. 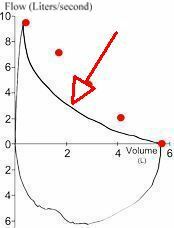 The inspiratory part of the loop is shaped like a half circle. The values of the parameters are higher than 80% of the predicted values, while the Tiffeneau index (FEV1/FVC*100) is higher than 70. Obstructive lung disease is the most common diagnosis of a lung pathology when using a spirometer. 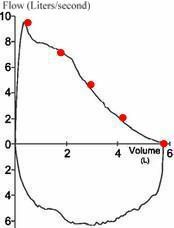 The Tiffeneau index is below 70, which results in an indented or concave expiratory part of the flow-volume loop. When obstructive lung disease is present, often a post-medication test is performed after administration of a bronchodilator like ventolin. In case the obstruction is reversible (FEV1 post-medication significantly higher than FEV1 premedication), the patient is likely to suffer from asthma. 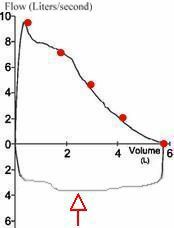 Restrictive lung disease can not be diagnosed with a spirometer because spirometers can not measure residual volume. 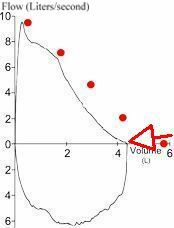 A spirometry test can however be suggestive for restrictive lung disease when FVC is too low (less than 80% of the predicted value). 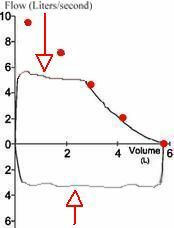 Peak Expiratory Flow and FEV1 can be normal in restrictive lung disease, but are often low as well. A spirometry form a patient with mixed lung disease shows both signs of obstructive and restrictive lung disease: both Tiffeneau and FVC are too low. Upper airway obstructions are rare.